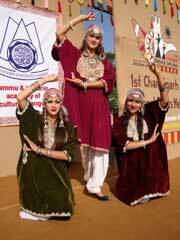 10 day National Crafts Festival at Chandigarh inaugurated. National Crafts Festival at Chandigarh. Chandigarh, October 24 - The magic of Cultural diversity of Jammu and Kashmir today fascinated thousands of spectators assembled at Kalagram here on the inaugural ceremony of 10 day long National Crafts Festival. The Jammu and Kashmir is the theme State in this first ever National event designed on patron of world famous Surajkund Mela, was inaugurated by General Dr. S.F. Rodrigues, PVSM VSM (Retd. ), Governor of Punjab and Administrator, Union Territory, Chandigarh here this morning. The event has been jointly organized by Jammu and Kashmir Academy of Art, Culture and Languages , North Zone Cultural Centre and Chandigarh Administration. Around 100 artists from Jammu Kashmir and Ladakh performed at the inaugural ceremony and around 150 artists would perform at the main venue from 6 to 11 pm this evening. Strongly advocating the need for a well structured coordinated plan for strengthening linkages of composite Indian culture, the Dr. S.F. Rodrigues, called for adopting a holistic approach for the preservation and promotion of our inherited values. He said the main objective of organizing this event is to built understanding between various Cultural groups of India. He said he had served in Jammu and Kashmir for several year. He congratulated the Jammu & Kashmir artist, J&K Cultural Academy, NZCC for holding of extraordinary programme . Speaking about the heritage, he said , it is, therefore, imperative to create a responsive mechanism for generating awareness among our people to respect our traditions & the customs of different regions. He directed the NZCC to preserve the dying arts for researchers and all generations to come. The main attraction of today’s show included Kashmiri Rouf Dance, Chajja Dance (Dogri), Bhand , Kashmiri Folk Theatre performance by Gulmarg folk theatre group , Bagston Tses by Ladakhi group, Gojri Folk Music, Pahari Folk Music & Dance, Chakri (Kashmiri Music) Haran Dance (Dogri), Purgi Dance by Kargili Grpoup, Bachnagma, Kud Dance (Dogri), Dhamali Dance. Around 3 lakh visitors are expected to come to this National Festival during these 10 days.